Eldoret, Kenya, December 2013. Length is about 12 mm, not including the legs. At first glance a crane fly might be mistaken for a super-sized mosquito. But these are harmless insects that mostly do not even feed as adults. 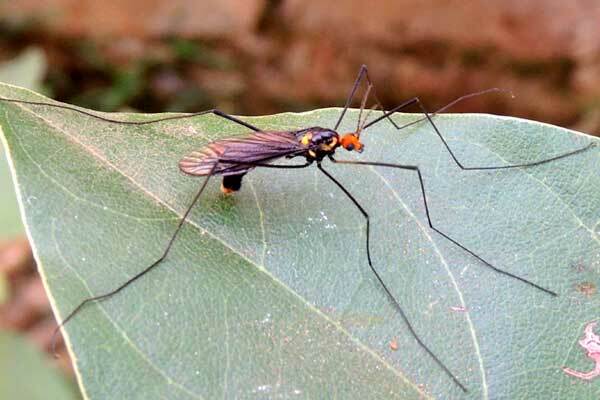 The very long legs break off easily and this may help them evade predation. Normally the adults live only a few days so they can afford to lose a leg or two and continue on their quest to mate and lay eggs. The immature stage is a larva, called a leatherjacket, that lives in moist soil, water, or decomposing vegetable matter. This species appears to be a mimic of a wasp and may gain some protection when birds avoid predating it. There are many other species to be found in Kenya and many are quite common, particularily after rains.